AccuWeather reports the southwest Gulf of Mexico has given birth to the Atlantic basin’s fourth tropical storm of the season. Dolly is expected to take a northwest path this week that will cause the system to move onshore in northeastern Mexico and well inland. Rough surf and the risk of strong rip currents will spread from the northeastern Mexico coastline to the beaches of South Texas into Wednesday. “The system will only have a short time to develop, before moving onshore near LaPesca, Mexico, during Tuesday night,” Kottlowski said. 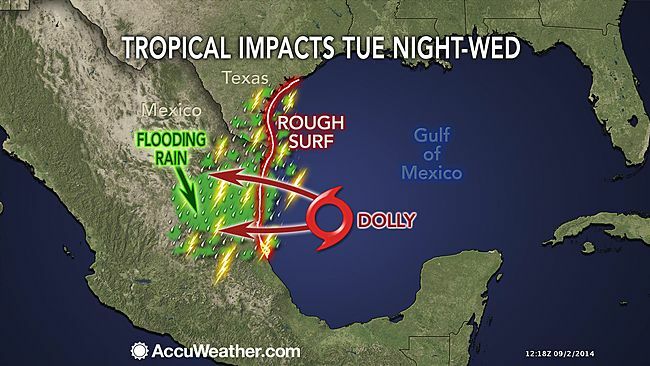 As a result, Dolly is not likely to become very strong with a slim chance of it ever becoming a hurricane. People along the coast of northeastern Mexico will need to monitor the situation through midweek, as there will be the increasing potential for rough seas, heavy rain and perhaps damaging thunderstorm wind gusts. Kottlowski warns that the system will bring the risk of life threatening flash flooding and mudslides in the foothills and higher terrain of the Sierra Madre Oriental mountains, regardless of how strong it becomes. Major cities in Mexico that can be affected include Veracruz, Tuxpan and Tampico. Brownsville, McAllen and Harlingen, Texas, may also be on the fringe effect of the system, in the form of showers and thunderstorms. On a positive note, much of the area from the Yucatan Peninsula to northeastern Mexico and South Texas is in need of rain. Downpours affected the Yucatan Peninsula and part of Central America this weekend, where rainfall has be well below average this year so far. “The water is very warm in this part of the Gulf of Mexico,” Kottlowski said.The warm water will add energy to the system as it churns over the Bay of Campeche. Wind shear increased over the region in the past 24 hours. Wind shear refers to belts of winds in the upper levels of the atmosphere that can shred apart tropical systems when strong. The orientation of the southwestern Gulf and how it aligns with the counter-clockwise flow around developing systems may be another contributing factor to tropical development. “Weak systems that enter this region of the Gulf of Mexico tend to be aided by the curvature of the coast, which helps to spin systems up into tropical depressions or storms,” stated AccuWeather.com Meteorologist Rob Miller. In terms of the 2014 Atlantic hurricane season, the year so far has been running slower than average in some cases and ahead of average in others. Excluding Dolly, there have been four other tropical depressions in the Atlantic, of which three strengthened and became hurricanes. The average date for the fourth named system is Aug. 23. However, the average date for the third hurricane of the season is Sept. 9. Cristobal became the season’s third hurricane on Aug. 24. The last time it has taken this long to get to the letter “D” in storm names was in 1994, when Debby formed on Sept. 9.